After measuring and cutting some MDF that I had left over from another project, I had four 8-10 inch gate bases. The suggested size is close to 7.5" wide so I left a little extra to dress up the base. I used a monster truck as my guide for how tall to make the gate as I don't think I'll come across anything taller than that. I cut and glued the girders to the base and added some bits I found in my box from the Pegasus Hexagon Platformers series. These make great light bars to hold in place some flood lights to illuminate the gate during night races. I used some scrapbooking paper to make the metal sheeting and then glued some sand to the base. 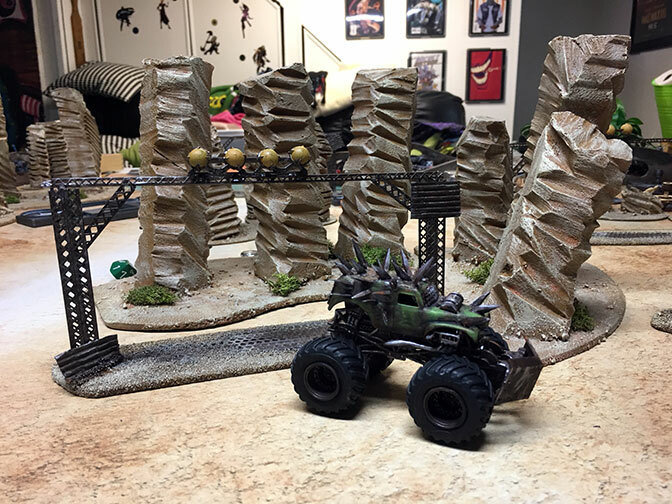 Years ago I made a bunch of desert terrain and I planned on using it on the Front Line Gaming Badlands mat; however the color was off and my terrain had seen better days. (When I used to Henchman for Wyrd Games I packed up 3-6 Malifaux tables each week for the events I ran, packing and moving terrain can be rough on it). To rectify the problem I busted out my handy Shermin Williams paint deck and found some colors that match. For the record Leather Bound SW 6188 and Blonde Sw 6128 match the dark and light almost exactly. I took those to my local Home Depot and had them match the color, I prefer Behr paint for large terrain projects as it seems to be a little more durable and has better coverage. Paint in hand I set off to get my terrain touched up and ready to roll. After covering the existing paint job with the darker Leather Bound I then drybrushed everything with the lighter Blonde color. The result, a fresh looking desert terrain set that matched my game mat as well as some gates to start my 15-20mm scale terrain collection.